Mississauga, ON – The future of our community lies within the diverse group of disruptive technology startup businesses and innovative entrepreneurs that constantly think, challenge and create. When their work meets the expertise and attention of established businesses and investors that also reside within the community, partnerships are formed and strengthened by the mutual excitement in seeing products develop, businesses grow, and ideas expand. The City of Mississauga in partnership with Research Innovation Commercialization (RIC) Centre and Angel One Investor Network is hosting the First Look Angel Investor Meeting to foster the collaboration between the investor community and startup companies in order to promote long-term partnerships that will benefit businesses, their industry, and the surrounding community. “First Look is about connecting new, emerging and established business ventures with accomplished investors looking for cutting-edge ideas, products and services to invest in,” said Mayor Crombie. Nineteen high-potential early stage companies selected from five regional innovation centres (Haltech, Innovate Niagara, Innovation Factory, Innovation Guelph, and RIC Centre) will have the opportunity to take part in a gathering with members and guests of the related five angel groups from the Greater Toronto Area. “Now in its third year, First Look is producing real results for investors and start-up companies who want to build on their success, reach higher and lead the competition,” Mayor Crombie added. Advanced Opto-Mechanical Systems and Technologies Inc. (AOMS), one of the exhibiting companies at First Look 2016 and a RIC Centre client, announced the closing of their $925,000 seed round financing in 2016 with GreenSky Capital, including Ontario Centres of Excellence, GreenSky President’s Club and GreenSky Capital’s affiliated angel network. “Participation in the First Look Angel Investor Meeting provided AOMS Technologies with an unprecedented opportunity to meet with Tier I investors,” said Hamid Alemohammad, CEO of AOMS Technologies. Hamid expressed his gratitude to the City of Mississauga and Mayor Crombie for sponsoring and hosting this event. “As a result of participating in this event and meeting with investors, we were able to close our first round of capital financing in 2016 which lead to significant growth in our business.” The funds will enable the company to scale up its sales and marketing efforts, and expand innovation through continued product development. “I am proud that First Look has cemented its reputation as a popular, trusted and professional networking opportunity where ideas and innovation flourish and where entrepreneurs and industry professionals come together to launch the next big idea directly into the marketplace. I want to thank our community partners who work to ensure First Look will be another complete success,” conveyed Mayor Crombie. “First Look is a good example of the exponential power of the Ontario Network of Entrepreneurs. When the supporting ecosystem works together on a common goal of growing great companies we all benefit,” commented Pam Banks, Executive Director of the RIC Centre. 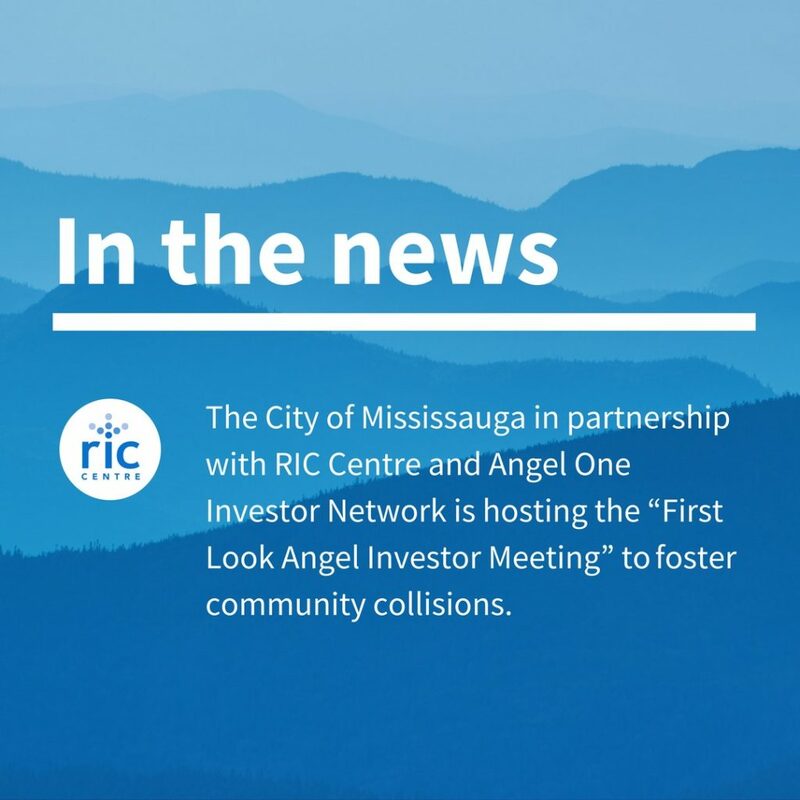 “Mayor Crombie’s encouragement and patronage of the First Look Meetings are indicative of her leadership and Mississauga’s commitment to a strong innovative culture,” noted Karen Grant, Executive Director of the Angel One Investor Network. Are you an accredited investor looking for investment opportunities with high-potential technology startups? You can join us on Wednesday, May 3, 2017 from 7:00PM to 10:00PM at Mississauga City Hall. For more details, including past success, visit our website here.